There’s loads of ways to enjoy Horrible Histories – the books, TV show, live shows – and now you can get the brand new Horrible Histories Magazine too! 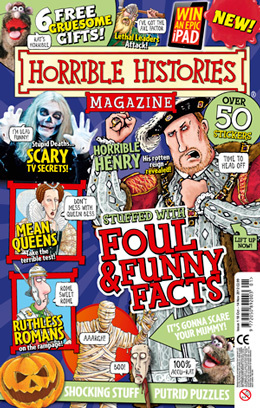 Horrible Histories is most likely the funniest, vilest and goriest magazine you’ll come across this month! It’s got loads of foul facts, vile jokes, putrid puzzles and gory fun to satisfy your thirst for all things gruesome!